Today is my Birthday and this is my Favorite PIE! I have been a Forever fan of Key Lime martinis. My mom went to a get together with her friends several years back and had the most amazing Key Lime pie so she decided to surprise me with it one year for my birthday! Well, can I tell you it’s probably the pie and dessert that I look forward to most each year! It is now a tradition. You guys, I have had a lot of pies, but I have never had a Key Lime pie as good as my mom’s! We think that it is the Nellie and Joe’s lime juice, which is like no other, as well as the sweetened condensed milk. 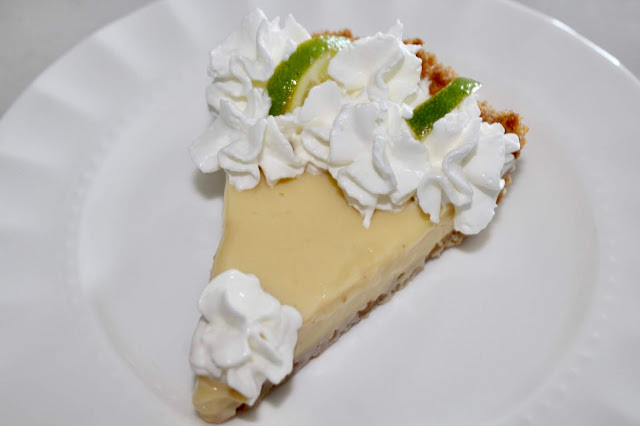 If you like Key lime pie, this is a must! And the simplicity and ease of making it cannot be beat! Throwback Cheers with my favorite Martini! Preheat Oven to 350 degrees. Combine crust ingredients and press into a 9” pie dish. Bake crust for 6-8 minutes. Combine condensed milk, egg yolks and lime juice. Blend until smooth. Pour filling into pie shell and bake for 15 minutes. Allow to stand 10 minutes before refrigerating. Just before serving, top with whipped cream and garnish with lime slices. Even if aging can be tough and frustrating at times, life still gets better with age!! As you may know, yesterday was suppose to be spent shopping and lunching with my sweet mama but a darn dump truck running a red light nixed that but She's ok and thank you for your thoughts and Prayers! Well hit the stores next week when she feels better! Tomorrow, I am having lunch and more shop time with a dear friend. Today, I am spending quietly to reflect on my blessed life and tonight Mr. Nine is taking me to the restaurant voted number one in the state, which happens to be 10 minutes from our house. I cannot wait to take my time getting all dolled up and have a wonderful birthday meal with my man! Happy, happy birthday! The pie looks delicious...it's my favorite too! I hope your mom wasn't too shaken up and all is ok. Happy Birthday! I hope you have the most wonderful day. And, so glad your mom is ok.
Happiest Birthday to you my precious, precious friend! Oh how I wish I was there to celebrate with you. 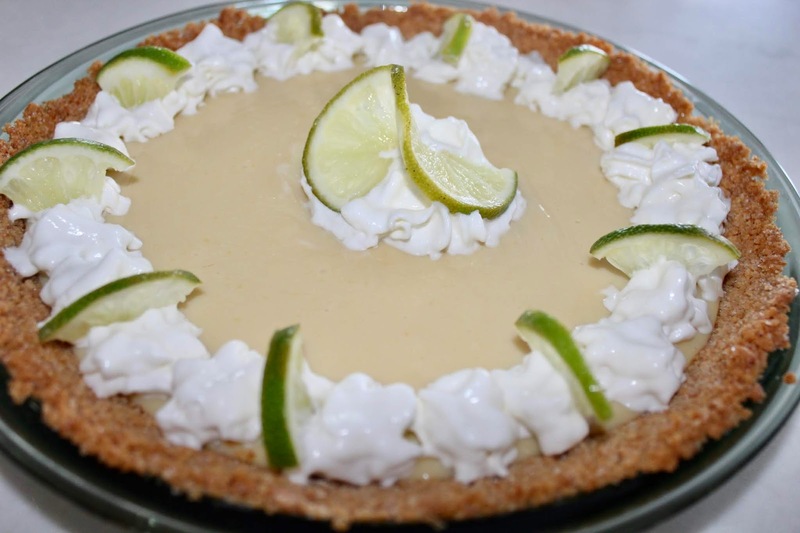 I have that same Key Lime pie recipe and it is the best - you are 100% correct, it's that Nellie & Joe's Key West Lime Juice and the sweetened condensed milk that makes it. Now even though I've made it before many times, trust me, mine have never been this beautiful! Your sweet mama decorated the pie so professionally! Have the very, very best birthday!!!! Love you to pieces! Happy Birthday 🎁🎊🎉 I hope your day is great just like you!! So thankful your mama is ok! 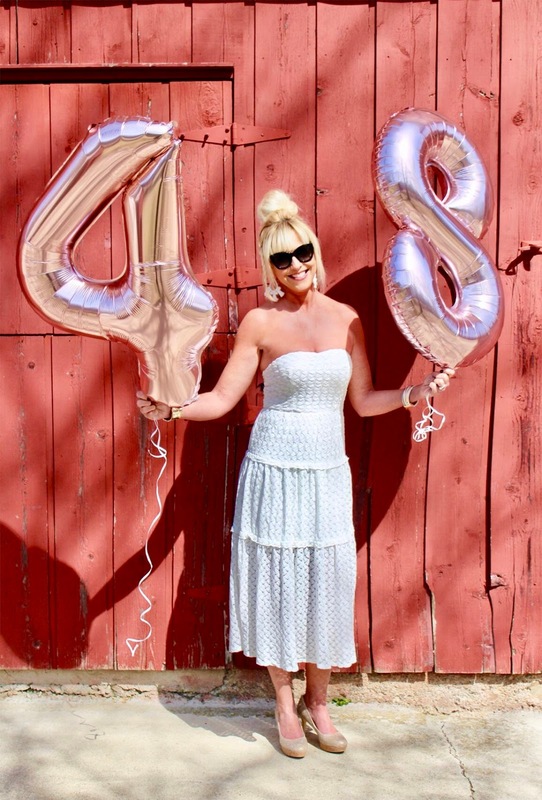 48 never looked so good!! HAPPY BIRTHDAY Beautiful Friend!! Happy, happy birthday!!! 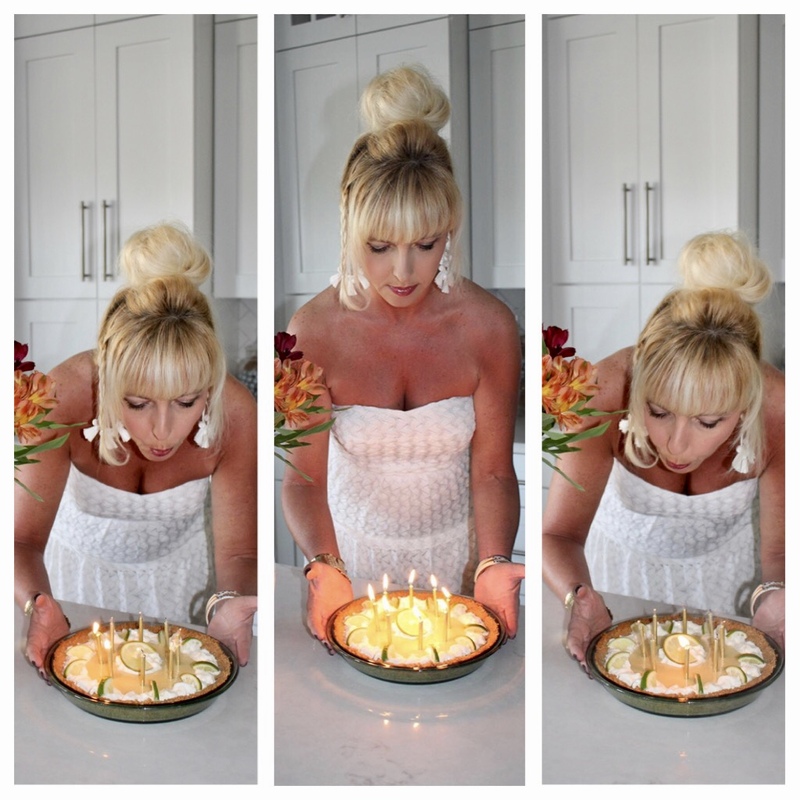 I hope you have the best birthday celebrations! Happy birthday to you! I have been looking forward to seeing your mom's recipe and can't wait to make it! I am so sorry things did not go as planned yesterday, I'm glad your mom is ok. Enjoy your day today! Happy Birthday gorgeous! 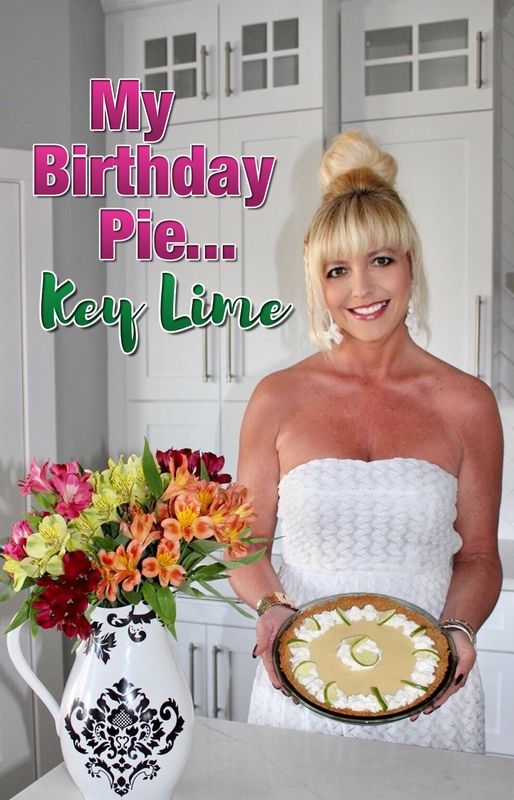 This key lime pie recipe sounds so good! I hope you mom is okay - so scary! Enjoy your day! Happy birthday, beautiful lady. have the most special day filled with goodness and glory! Happy birthday! Your birthday pie sounds like a wonderful tradition and this one looks delicious! Sorry to hear about your mum's accident, I'm glad she is okay and you can celebrate together later when she is feeling better. Happy birthday! That pie looks delicious and your white dress is lovely! Happy Birthday, Andrea! Mine is at the end of this week :). I don't know about the pie, but a key lime martini has my attention-ha! Enjoy your dinner, so glad your mom is okay-oh, my! The meme is so funny! Happy birthday sweet friend! You are an ageless beauty! We are also almost birthday twins as my birthday is this Thursday. 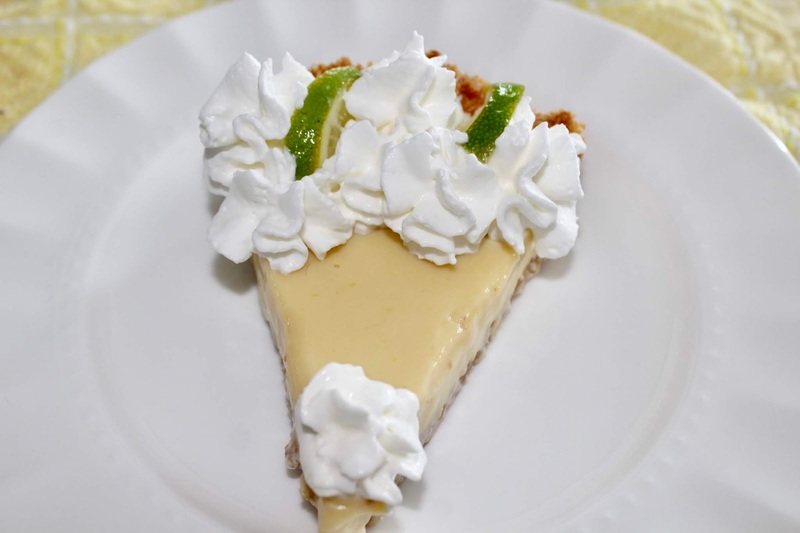 Key lime pie is SO good- and tastes like summer to me! Happy, happy birthday, lovely lady- you deserve all the best and you look AMAZING! Happy Happy Birthday Pretty Lady!! 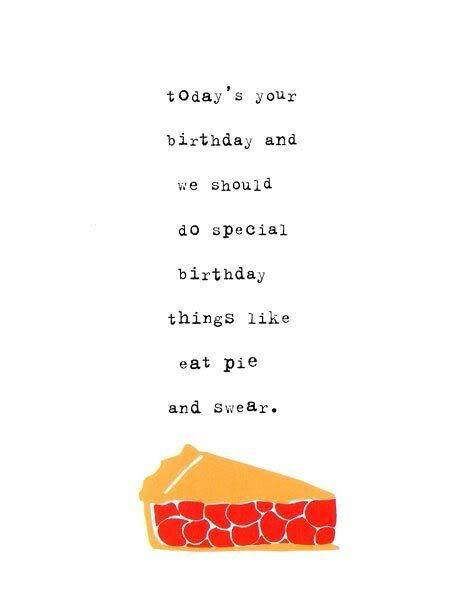 Hope you have a wonderful day filled with lots of sunshine and pie!! Love me some key lime pie. Sending much love to your Mom. Please give her a big hug from me! Also, you look AH-MAZING!! Happy Birthday Andrea! I hope you have the best day. Love a good key lime pie. Thank you for the recipe! Happy Birthday Andrea. You are beautiful inside and out. Praying your day is blessed. So thankful your sweet momma is okay. And, key lime is a favorite around here too. And we agree...the Nellies and Joes makes all the difference. Happiest of birthdays to someone who keeps aging in reverse. Love this!!! I hope you have the most incredible birthday & the most blessed year ahead of you my friend!!!! That pie sounds so good right now!!! I hope that you have the most fabulous birthday! And I’m so glad your sweet mom is ok! Happy birthday!!!!! Jacob requests a key lime pie as his birthday dessert over at my FIL's every year! He would love this and he would love to celebrate with you! Happy happy birthday to you once more! HAPPY BIRTHDAY TO YOU, HAPPY BIRTHDAY TO YOU, HAPPY BIRTHDAY DEAR SWEET FRIEND, HAPPY BIRTHDAY TO YOU! I hope you had a wonderful day! I told my hubby you are a girl after my own heart with key lime pie! yummmmmm. Looking beautiful as always! I'm so happy to hear your sweet Mom is going to be okay. What a scary thing! Happy happy birthday to beautiful you. I hope it's been the best day and that an even better year is ahead. Love you dear friend! I love Key Lime Pie and what an easy recipe, may just have to try it. Pies are my favorite dessert by far. So sorry about your Mom but so glad she is okay. Know tonight will be a special time of celebration as it's all about you my dear, it's your day! May the year ahead be richly blessed! Today is a special day Andrea because it is your birthday! Even though, I have not met you, I love your uplifting, fun, sweet and kind personality. I wish you the best day today and I am sorry that you couldn't spend time with your mom. I am just glad she is okay and that you are keeping on the positive. I do me some key lime pie! I had a slice in Key West a long time ago and have been a fan. I have never been quite able to find a place that replicated the delicious taste since and I am happy to know that this recipe is it! I can't wait to make and let you know. In the meantime, the happiest of birthday to you Andrea and enjoy your wonderful dinner tonight. Wishing you many, many more! Happy Birthday! Sorry to hear about the accident your mom was in and hopefully will be ok. How nice to have your favorite pie your mom made. Thanks for sharing the pie recipe. Enjoy your birthday week. Happy Birthday Andrea! I hope you are out having the BEST time at the #1 restaurant! You deserve it! 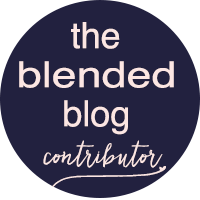 Thank you for being such a wonderfully supportive, bright and happy blogger friend! I know I'm a day late on the blog here, but happiest of birthdays to you my dear friend! love the dress and your fun giant sized balloons! Happy birthday again! We had key lime pie for our anniversary last night, haha! So funny, great minds! I'm so sorry to hear about your mom! I am glad she is ok! i hope you are able to enjoy time shopping with her soon! That key lime pie looks amazing! I love fruity desserts as the weather gets warmer! I need to try this! 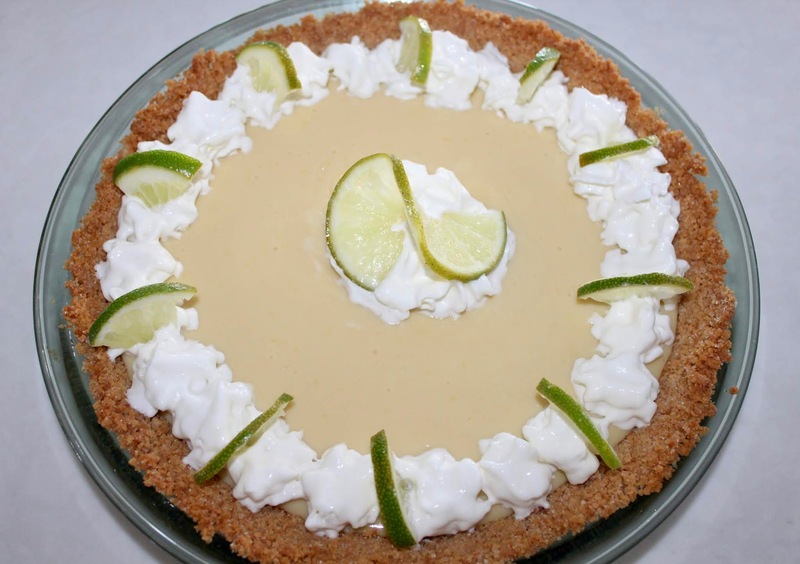 These pictures definitely make me think I need to explore this whole key lime pie thing! You know it's not that I don't like it....but I've never tried it!! Happy belated Birthday Beautiful!!! I hope you had the most amazing day!! Happy belated Birthday, you look amazing!! I dont think I have ever had a Key Lime pie, I think I might have been missing a good dessert!! Thank you for sharing on #omhgff hope you have a lovely week! I’m wishing you a very happy birthday. You certainly look beautiful in this white dress and I love the way your hair is styled. Keylime pie is also my favorite. I enjoyed this post and hope your year is the best ! 48 is not old by any means but I sure hope I look as good as you when I reach that age. Happy Birthday! Your pie looks amazing. I just had a key lime pie last week and it was amazing! My friend said the key was the lime juice (that you used!) too! I hope you had a wonderful birthday!